Beauty Frosting :: Breast Augmentaiton, Beauty, Baking, Being. I think we’re all on the same page here. We want to try to use all-natural products that are free of all the things we don’t want, but we still want the best of what beauty has to offer. This is especially true for me when it comes to deodorant. We’ve all heard about how we should be using natural deodorants, but we don’t want to smell, um, “natural” while doing so. I mean, I want a deodorant that works as hard as I do, especially when it comes to working out. I need a tough guy that will stay tough during spin and barre class! Is that too much to ask? 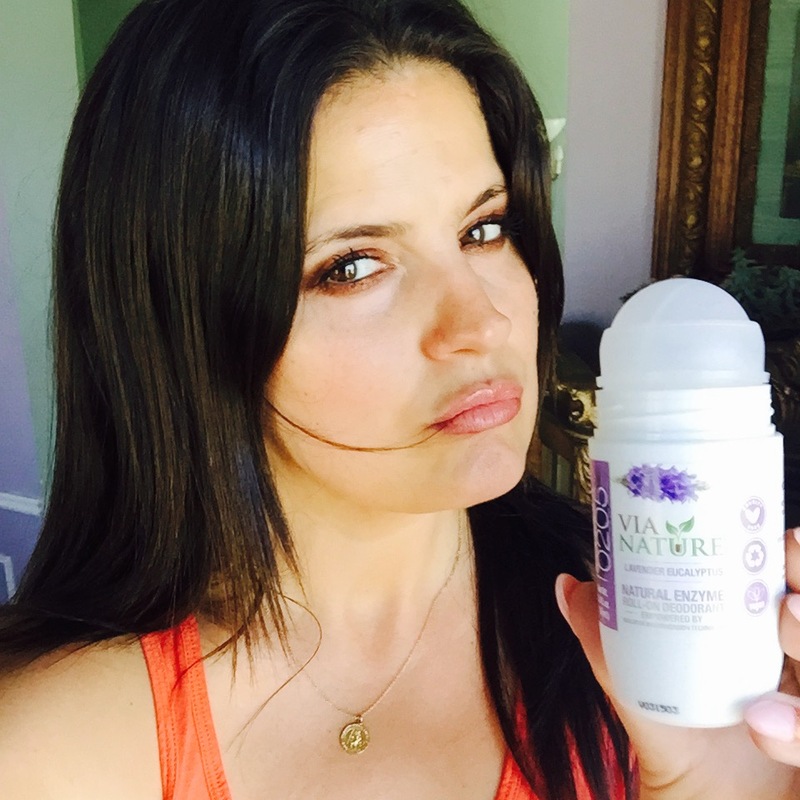 Is it too much to ask for an all-natural deodorant that works as hard as I do when working out? Apparently not, thanks to Via Nature all natural deodorants. Yep, I think I’ve found the perfect marriage of both in Via Nature natural deodorants. 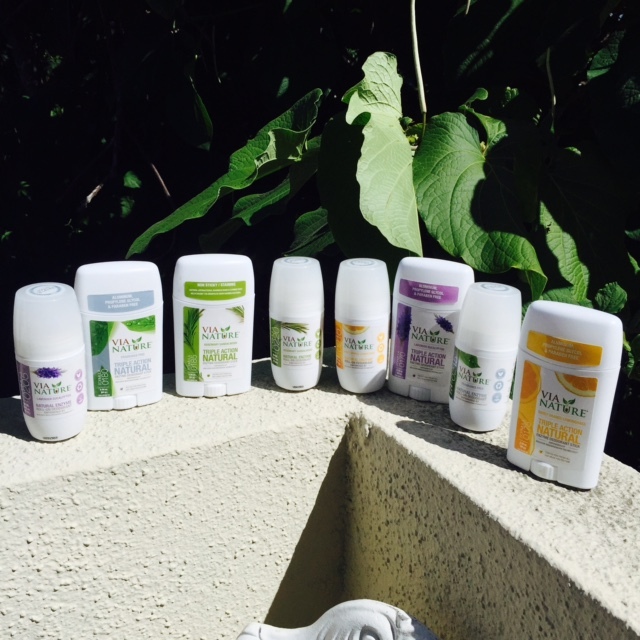 And there’s a wide array of Via Nature deodorants to choose from! Via Nature deodorants are enzyme-infused, and neutralize odors without those pesky toxic chemicals. How? A proprietary blend of naturally derived enzymesneutralize and fight odor-causing bacteria. Essential oils provide light yet effective natural fragrance. Magnolia bark and licorice root extracts stabilize long-lasting protection. Plus, they’re non-sticky, so I’m all on board with that. Free of artificial fragrance and gluten, Via Nature natural deodorants are vegan, cruelty-free, and never tested on animals. The formulations avoid aluminum compounds, parabens, phthalates, sulfates, synthetic dyes, triclosan and other petrochemicals. Unlike many other natural deodorant brands, Via Nature also eschews baking soda in roll-ons and sprays; baking soda can cause contact dermatitis—an uncomfortable skin reaction—in the delicate underarm area. Available in three unisex scents derived from essential oils—Via Nature natural deodorants provide all-day protection and performance you can depend on. Also, they offer us a ton of options of application and scent, depending on your preference: roll-on ($5.99), stick ($6.99) or spray ($7.49), and scents including Rosemary Sandalwood, Sweet Orange Lemongrass, Lavender Eucalyptus, and Fragrance Free, for us sensitive souls. My personal fave? The oh-so-calming Lavender Eucalyptus roll-on. Switching from chemical to natural deodorant, but a little tentative about it? I love my buddy, Mommy Greenest’s suggestion: Take a two-week detox and try Via Nature’s deodorants. 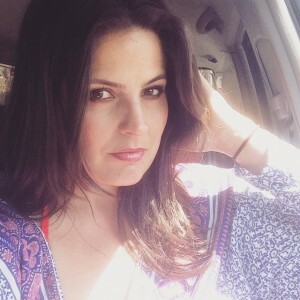 That Voice Sounds Familiar: Dawn as the New Voice on Pandora Radio! Remember that big announcement I was gonna make on Instagram? Well, here ya go. Look Ma! Er, I mean, listen! I’m on the radio!!! 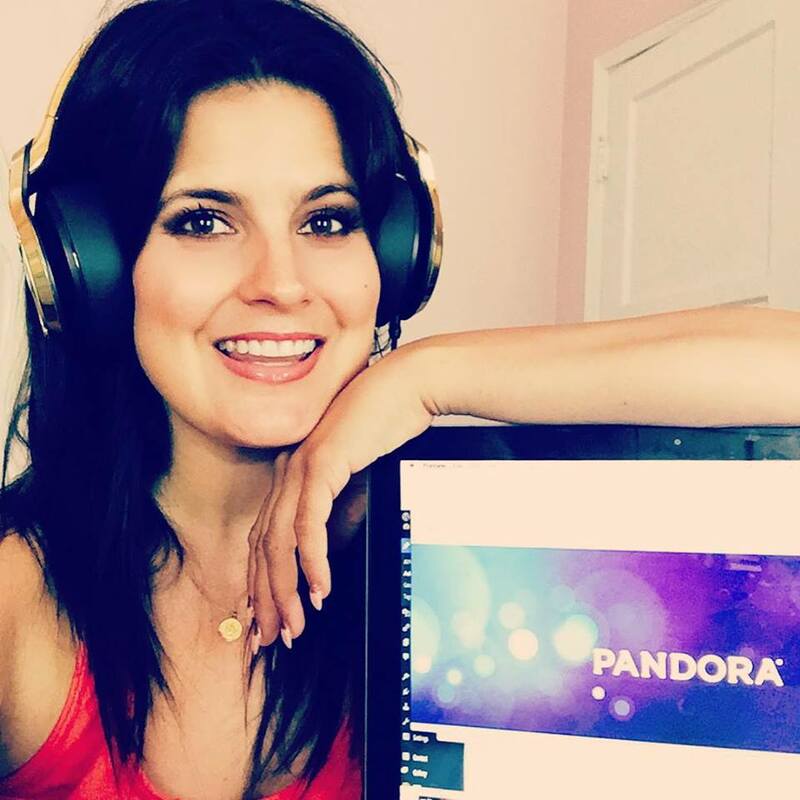 I’m thrilled to announce that, as of yesterday, I’m the new voice that you’ll be hearing on Pandora, in between your songs. I started out as an actor out here in LA, then became more of a singer with my band, Hawkeye and my Nashville album, Sweet Time (which was on Pandora), and now life comes full circle, combining all of my careers on Pandora – a place where the folks have always been awfully good to me as an artist. This is one of those times when I have to point out that that I just can’t believe in coincidences. Life is too sweet and synchronistic, and I’ve got too much gratitude to call it a coincidence. Special thanks, to my agents at AVO Talent for making this happen! Sounds like my kinda place! That’s what I heard as soon as I stepped into the Mandalay Bay Ballroom to host the red carpet for the 26th annual North American Hairstyling Awards in Las Vegas. And, hair heaven it was. 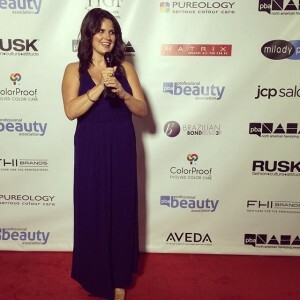 It was a dream come true to be asked by NAHA to be the official host of their red carpet pre-show, but it was a true INSPIRATION to meet all of the talented nominees and visionaries. Brad Goreski shined when he hosted inside, but I had the chance to catch up with him before on the red carpet. The evening’s host, Brad Goreski and me on the carpet. It was also good to catch up with my buddy – and hair royalty – Eden Sassoon. And, I loved getting to meet Miss America herself, Kira Kazantsev – what a beauty inside and out! There she is, Miss America…no, not me. That’s me with Miss America 2015, Kira Kazantsev. There were 3000 attendees this year, but the real spotlight was on the nominees and winners. The paparazzi on fleek. Yep. I just said on fleek. 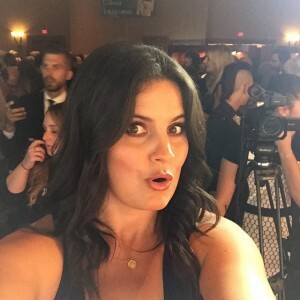 This was the first year that there was a Nails category, and I had so much fun – and a little envy – checking out the talons on all of the nominees. Here I am with nominee, @Princess_Paige1. A little nail envy: I thought I had long, beautiful nails until I saw the Nail nominees on the red carpet. 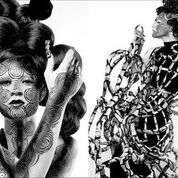 And here they are…THE WINNERS OF THE 26TH ANNUAL NORTH AMERICAN HAIRSTYLING AWARDS!! And there was pleeeeeenty of celebrating at the BangStyle after party! Trying to be street cool – and obviously, not succeeding at it. At least the party was a blast! My heartfelt congratulations to all of you winners – and nominees! I can’t wait to get back to hair heaven next year!! When Philosophy invited me to celebrate their 16th anniversary on QVC, I was beside myself! Getting in on the Philosophy & QVC 16th anniversary fun! 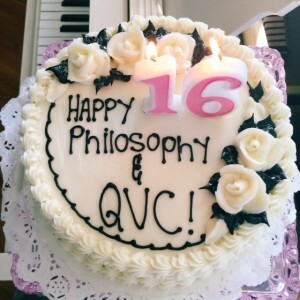 Happy 16th Philosophy & QVC! See, I’ve been a fan of Philosophy for as long as I can remember – so much so that I feel like I grew up with Philosophy. In fact, I can mark milestones in my life, based on the Philosophy products I was using at the time. My first introduction to the line was when I was 21 and a senior at the University of Texas at Austin, when I treated myself to one of their darling dessert-themed all-in-one bath & shower gels, Apricots & Cream, that satiated my sweet tooth without the calories, as I showered in the Kappa house. Today, I still bathe with the sweet stuff. One staple I always have in my bath? 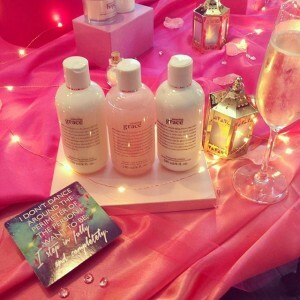 Philosophy bath & shower gels. Here’s one of my all-time faves: Apricots & Cream. Not just because it smells heavenly, but also because it matches my peach bathroom! 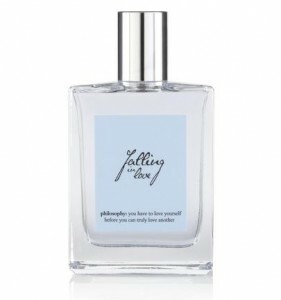 Later, at 25, I fell in love all over again with Philosophy, when I couldn’t get enough of their Falling In Love fragrance and Falling In Love bath & shower gel, as I was falling in love, myself, with a new boyfriend. Then, at 30, as I started seeking the perfect skincare regimen for my thirtysomething skin, I fell in love once more with Philosophy, when I tried their Hope In A Jar (most famous for being Oprah’s favorite moisturizer). Hope is all we need. 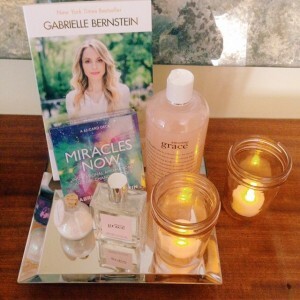 Now, at 37, I fell in love yet again, when I attended their QVC Month of Miracles anniversary party, where the guest of honor was bestselling author, Spirit Junkie, miraclemaker, and Philosophy ambassador, Gabby Bernstein. Grace, Gabby, and miracles galore at the #QVCMonthOfMiracles party at the Sunset Marquis. I am as big a fan of Gabby – and her latest book, May Cause Miracles – as I am of Philosophy, so the joining of the two was almost too much for this heart to take! (Editor’s note: Interview with Gabby coming sooooon). It’s a beautiful marriage because Gabby is all about miracles and Philosophy’s motto is to believe in miracles, as Philosophy is a company founded on science, as well as inspiration. Amazing grace – how sweet the sound, sight and smell. A miraculous day that none of us will soon forget. Gabby, me and miracles galore. Not only is Gabby a Philosophy ambassador, but she’s also on the steering committee of Philosophy’s Hope & Grace Initiative, a cause near and dear to my heart. The Hope & Grace Initiative touches hearts to heal minds, by donating 1% of any and all net product sales to support community-based mental health efforts. 1 in 4 adults experiences mental illness in a given year, and Philosophy’s Hope & Grace Initiative provides over 100 community-based mental health organizations each year, with up to $50,000 in support. July 15th also marked the charity’s 1-year anniversary. A month of miracles, indeed! That’s why I feel good giving Philosophy products as gifts, whether it be a Sweet Treats Discovery collection ($28.42) to a friend for her birthday, the blushing Philosophy Celebrates Miracles 5-piece collection ($69.98) to my bride buddies, or divvying up the Mega Miracles 8-piece collection ($229.86) amongst my best friends on Friendsgiving as favors. Not only am I giving those I love a gift that they’ll love, but I also know that a portion of my money will be used to help a cause I love. What could be more miraculous than that? Happy, happy 16th anniversary Philosophy and QVC! To many, many more milestones together…and candles. I Don’t Like This Picture…But I LOVE This Moment. I don’t like this picture I have broken nails, I peeled the polish off my pinkie nail, have a random red mark on my chest and my eyes look asymmetrical. I don’t like this picture, but I LOVE this moment. But I LOVE this moment. You know your best friend Matt Marr knows you as well as he knows himself, when you’re walking out of ‪Amy Schumer’s Trainwreck at Arclight Culver City and in the middle of a story, he gasps, saying “Oh my god. This light is beautiful. Give me your phone,” and starts snapping pictures. I learn from him every day as my friend, my neighbor, my brother and as a human I aspire to be more like. He really is the best person I know. I love him to bits. And I’m learning to love myself, because of – not in spite of – my imperfections – a little more every day. I’d like to think we’re all here to help one another do just that. I’M LOVING…Vaseline Intensive Care Spray Moisturizer Aloe Soothe – Spray & Go! Fun on the heart, heavy on the wallet, and HELL on the skin. I had such a ball hosting the red carpet for the North American Hairstylists Awards at the Mandalay Bay in Las Vegas this past Sunday in the aforementioned Las Vegas. But my skin? Well, it didn’t have such a ball. The morning after the big award show, my skin was ashy, dry and just sad looking. But, I was slated to wear a breezy short summer romper that day that would show off my legs and arms. So, what’s a parched girl to do? Well, lucky for me, I packed my Vaseline Intensive Care Spray Moisturizer Aloe Soothe ($6.49) in my bag and took it with me to the convention center for my brand meetings at Cosmoprof. Vaseline Intensive Care Spray Moisturizer Aloe Soothe to the rescue in the desert! I stepped outside and sprayed it on, and I was good to go in under 10 seconds. Best of all, you can hold the bottle any which direction, and with its 360-degree continuous spray technology, you’re covered. 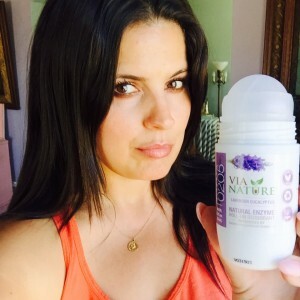 It’s the perfect moisturizer for the busy girl like me on the go. I mean, you literally just Spray and Go! Yep. It’s really that easy! So, how’s it work? Its unique fast to apply, quick to dry formula heals dry skin in seconds, and all without staining or sticking to your clothes. Plus, it’s good for us senstive-skinned sirens, which isn’t always easy to come by. The final verdict? With micro-droplets of uber-hydrating Vaseline Jelly to heal dryness, my skin was glowing and soft in seconds, with no grease in sight. Now, that’s a winning bet. Dawn Do? Spray on Vaseline Intensive Care Spray Moisturizer Aloe Soothe, right after your nighttime bath on towel-dried skin for deeper absorption. And, during the day, spray on your moisturizer and then rub in your favorite luminous bronzer for an instant glowing hue. I’ve always been scared of a strong brow. I’m not sure why exactly, but I always equate a strong brow with strong women, like Anjelica Huston, and until recently, I feared being strong, as girls sometimes do. I wanted to be delicate. Light. A wisp of a thing. A pixie. Guess what? At 5’9″, I am none of these things. True confession. So, in the last few years, I’ve grown up – and embraced who I am, and part of that is embracing the fact that I am indeed a strong woman. And, likewise, I’ve embraced strong brows, as well. But strong brows? Well, they need to be shaped and maintained by a strong aesthetician. 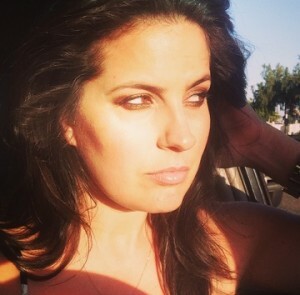 Enter the Wonder Woman of strong brows, Kristie Streicher. Yup.That’s Kristie. And yup, she’s THAT killing in person. A gorgeous girl who’s destined to gorgify your brows. p.s. And noooo, you don’t have to go purple like she did here…but the beauty is that you could! Kristie’s studio, Striiike, has become the go-to celebrity brow beauty bar, in Beverly Hills. Hair clipped back and ready for better brows. Meow. 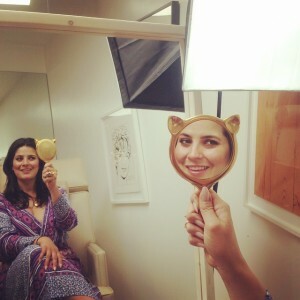 In the chair with Kristie and the cutest kitty cat mirror that you ever did see. I walked out, feeling a little like Linda Evangelista, circa 1992…and I mean that in the BEST way. Kristie is gentle, fast and you’re transformed in mere minutes. While it’s not the cheapest option (shaping ranges from $100-$200), I would argue that it’s the single best thing you can do to improve your beauty routine. Look! Even with my eyes closed, my glamour is on point with those Kristie-shaped brows! When your brows are full, shaped and strong, you’ll find your other features complement one another more, and you’ll even find that you don’t have a need for as much makeup as usual. More brow means less makeup. Plus, did I mention how much fun she is? She had me laughing and feeling more confident, all in our 30-minute sesh…and there wasn’t even wine involved!! This girl? Good times. Gorgeous brows. What more could you want? So, if you’re looking to give good face, look no further than Kristie. It’s a glamour gamechanger for sure. *Sidenote? I went last in April and am JUST going back for my follow-up visit this week. It’s July, y’all. That’s how good she is. FUN FACT: The one brow product Kristie swears by? Mary Kay Brow Gel ($10). She says it’s a must-have to keep brows in line. And since she recommended it to me back in April, I’ve been swearing by it, too. Plus, as a Dallas girl, I loooove me my Mary Kay! Who knew? The must-have brow product? None other than Mary Kay brow gel. So says brow expert, Kristie Streicher. Talk about a party in a basket! My friends, Christopher and David, are always the most lovely hosts, when I stay at their house in Palm Springs. And, lovely hosts deserve lovely host gifts! So, for the past few visits, I’ve swung by my favorite neighborhood market, Joan’s On Third, to pick up some tasty sundries. I picked up some of Joan’s famous spiced pecans, assorted cheeses (a sharp cheddar, Humboldt Fog, sheep’s milk, and creamy goat), quince jam, a baguette, and some gluten-free crackers. I added in a few bottles of my own Club W vino from home, and carried it all car-friendly in a retro wooden crate from Marshall’s. 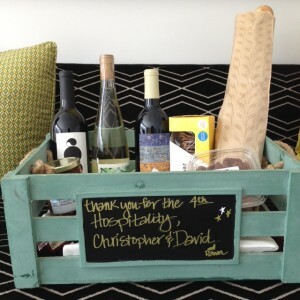 The crate is customizable with a chalkboard panel – perfect for a note of gratitude to the best hosts ever. A customizable chalkboard makes the gift extra personalized! Good thing I brought this party in a basket…because we ended up hosting quite the impromptu July 4th fête! 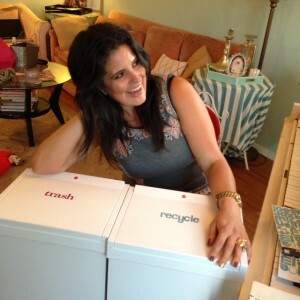 Dawn’s DIY: Getting Trashy with The Container Store! Trashcans. Umm, is there anything less romantic or less exciting than trashcans? Not much. Well, my buddies at The Container Store have changed all that. Take your trashcans from boring to beautiful with help from The Container Store! My mom has always sworn that the only place to get trashcans is at The Container Store. And, I am continuing that trashcan legacy…with my own little twist on it. For the past 5 years, I’ve had trashcans from The Container Store, that I decorated with some fun glitter stickers, to just give me a little daily delight when I go to throw something away. Hey, it really is the little things, people. So, when those trashcans started looking a little sad and worn, I went right back over to The Container Store, picked up 2 of their Halo trashcans, and picked up a few packages of glitters to make ’em sparkle. Here’s how I did it, and how you can, too! 1) Start with white, black or metal trashcans. They can be as basic as these white Halo touch lid trashcans, ‘cuz don’t worry, we’re gonna spruce ’em right up! 1) Start with simple, basic trashcans with a flat, non-textured lid. 2) Take that tape measurer, and measure the trashcan lid from top to bottom, marking the midpoint with the pencil. Measure the trashcan and find your midpoint. 3) Using the side of the sticker package, draw a light line with the pencil, which will help you place the letters in a straight line. Using the side of the sticker package, draw a light line, to help with straight placement of letters. 4) Stick on those stickers – and that’s it – ta-dah!!! You’ve got sparkling trashcans, my friend. The ingredients for this BF Trashcan DIY create a sparkling trash experience. Wait. That sounded way cheesier than I thought I would. And it can be fun for the whole family – and, not to mention – suuuuper easy! Dear 15 Me: Demi Lovato and…a Devonne By Demi GIVEAWAY!!! I asked Demi Lovato my favorite question, “What would you say to your 15-year-old self if you could go back in time?” This was her answer. She’s a good one, that Demi. What would Demi Lovato say to her 15-year-old self? “YOU’RE NOT FAT…’ and a few other golden nuggets of hindsight wisdom that I love. 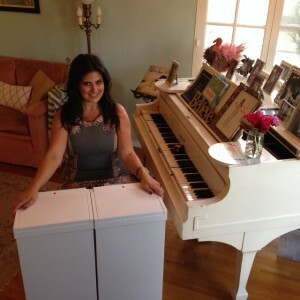 I am thrilled to announce our first-ever #Dear15Me & BeautyFrosting giveaway. We’ll be giving away 2 (!!!) Devonne By Demi giftbags, filled with Demi’s new skincare line, and signed by Demi, herself. p.s. Stay tuned for my interview with Demi, coming up soon on FabFitFun and here on BeautyFrosting!